You'll Never Want to Stay in a Hotel Again! You'll Never Want to Stay in a Hotel Again !!! Our clean, warm, & inviting condo has 2 bedrooms and 2 bathrooms and all of the comforts of home. The living room has a sofa and loveseat, as well as cable TV, and usually a DVD player for you to relax with. The dining areas are comfortable for meal times with the family. The Master Suite which is separated from the other bedrooms includes a kingbed, TV with cable and a walk-in closet and its own full bathroom. The 2nd bedroom has sleeping arrangements consisting of twin beds. The condo also features a fully equipped kitchen: full size refrigerator with oven/flat top burners, dishwasher, microwave, blender, toaster, coffee maker dishes, utensils, silverware, pots, and pans etc. 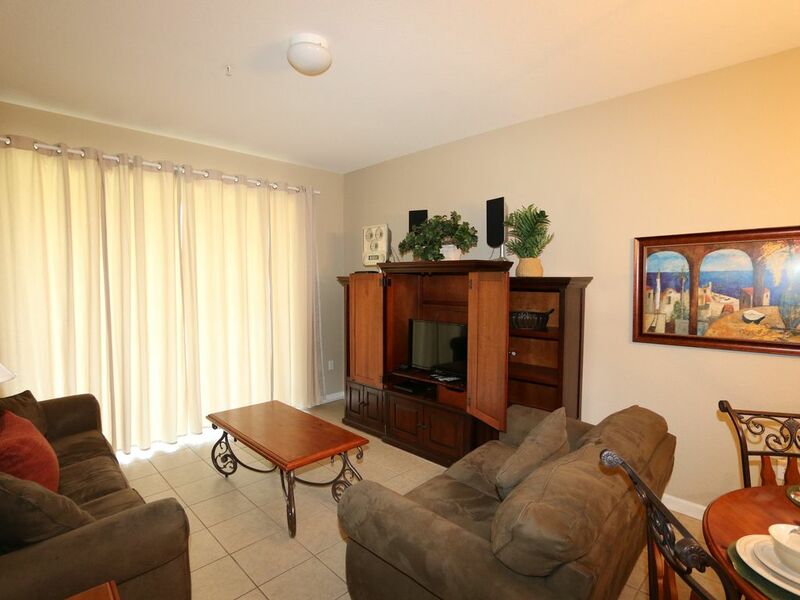 full size washer, and dryer in unit, just beyond the living room is the lanai for your morning coffee and fresh air. Amenities Galore here at Windsor Hills. Windsor Hills offers the highest level of comfort for your vacation dollar. The privacy gated Windsor Hills Resort Community caters to the vacationer`s every need! The spacious clubhouse includes a luxury water park pool with fountains, waterslides and a spa, as well as a zero-entry pool that`s perfect for toddlers. There is also a children`s playground, community grilling area, tennis courts and sand volleyball. In addition to the many exciting amenities offered by the Windsor Hills Resort, you`ll also find everything you need in your condo to make you feel right at home. We have rented many places in the Kissimmee area. Checking in was easy and guard gates kept us very safe. Nice pool and even water slides! Best of all, the Condo was clean and easy to access. The price was great and the property owner did not charge the "extra" fees. Would stay here again! Very nice apartment on first floor with a patio in a gated community! Close to Disney (10 - 15 min drive depending on traffic). Perfect if you go with kids! Washing machine, dryer, dish washer is available. You have access to the shared pool and hot tub which was very relaxing after a hot day walking in the parks. Please don't forget checking the email you provided here after booking this apartment. You will get separate instructions from Palmtree Vacation Homes where to pick up the documents needed to be granted access to the property and get your access card to open the gates from the security officers. They will not let you in without those documents! Perfect location close to all the Disney parks! My friends and I completely enjoyed our stay! The condo was clean, comfortable, and minutes away from all the Disney parks. I have stayed in this area every time I come to Orlando and have never been disappointed. I'm not sure if this was just our GPS, but we had trouble finding the specific building to check in as our GPS said the address given covered an entire strip mall so this was confusing. This is just a heads up to anyone staying here who has a little trouble finding the building too. This unit was clean and well maintained. After this visit I will never stay in a hotel again. Windsor Hills is very close to the Disney parks. The only thing I didn't like was that the air could not be turned below 76 degrees, and my family needs it a little cooler. My wife and I and our teenage daughter stayed here for 6 nights. A few minutes from Disney and 30 minutes from Universal, the location is great. The check in process was quick and easy and the apartment was clean and ready for us. Our only complaint would be the beds - very hard mattresses. Everything else is great. We enjoyed our stay and would book this rental again. Thanks! Great location, close to Disney. Nice heated pool. However, this unit was lacking comfort. All mattresses were poor quality. Master bed mattress was in poor shape with a lump in the middle & 2 sunken sections on each side. Pillows were old, squishy & stained. Temperature control was locked & unit was warm with humidity. Otherwise okay. Take your own wash clothes & anything you need (laundry soap, dish soap, salt/pepper, paper towels, toilet paper), etc. No extras in this unit. Just a few miles from all the Walt Disney World, Universal Studios Orlando & SeaWorld Orlando theme parks. Legoland Florida, Busch Gardens Tampa & NASA's Kennedy Space Center just an hour away - fishing, surfing & your pick of the beaches are all with a short drive!